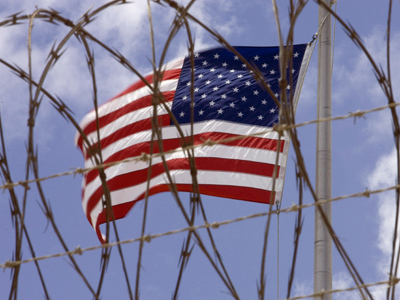 Detainees being held at the Guantanamo Bay detention facility and their defense attorneys are accusing both the United States government and Gitmo guards alike this week of infringing on the inmates’ rights by conducting illegal surveillance. Only days after lawyers representing alleged terrorists accused the government of spying on confidential inmate-attorney conversations by using hidden microphones placed in meeting rooms within the facility, the counsel for Yemen national Walid bin Attash said on Thursday that her client’s private legal papers were improperly removed from his Gitmo prison cell when he attended a recent court hearing. 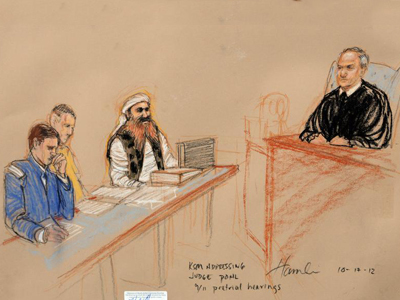 Bin Attash was appearing before the military court on Tuesday, attorney Cheryln Bormann claimed early Thursday, when his Gitmo cell was allegedly ransacked and legal documents were removed. “The guard force was in fact seizing privileged communications,” Bormann said, according to Bloomberg News. During a heated moment amid Thursday morning’s hearing, an unshackled bin Attash stood up in the court and spontaneously addressed Army Col. James Pohl, the military judge presiding over the case. "In the name of God, there is an important thing for you," bin Attash said before being silenced by the judge. 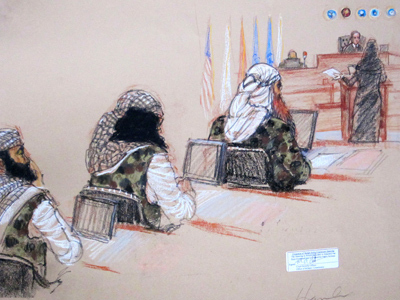 According to an Associated Press report, Col. Pohl told bin Attash that he had to remain quiet unless testifying from the witness stand, to which the inmate fired back, "I'm not here to testify.” In fact, his attorney explained to Col. Pohl that bin Attash is concerned about attending any further pretrial hearings because he is fearful his belongings will be removed from his cell each and every time. 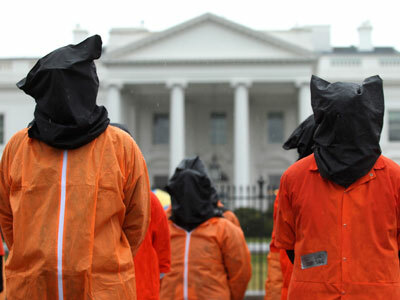 Stanley Cohen, a human rights attorney based out of New York, told RT during a phone conversation Thursday afternoon that he thinks the entire legal proceedings regarding the high-profile Gitmo inmates “has been a circus since day one,” and that the Obama White House’s claim of being the most transparent administration in American history has been directly challenged by the snafus that have occurred during the lengthy legal proceedings. Sarcastically, Cohen said he is “shocked” over the recent wiretapping revelations, ordered under the watch of an administration that has not just kept defense attorneys from viewing important Guantanamo Bay legal documents in the past, but has now, apparently, has also spied on the conversations between attorneys and clients. Thursday morning’s revelation came just days after it was made known that meeting cells thought to be private venues for attorney-client conversations had been bugged with microphones installed by the FBI. 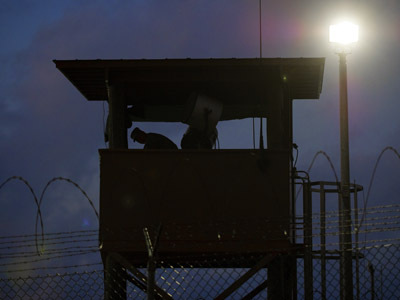 Navy Captain Thomas Welsh, who served as Gitmo staff judge advocate since May 2011, testified on Monday that although he had been aware of the devices, officials never used them under his watch to listen in on conversations and that monitoring ability is no longer possible. He did suggest, however, that the clandestine microphones disguised as smoke detectors could easily be considered by some to be a covert form of surveillance. "I agree with your point that it was not recognizable, it was not readily identifiable," Welsh said this week, adding that he himself had not discovered the devices until last January. 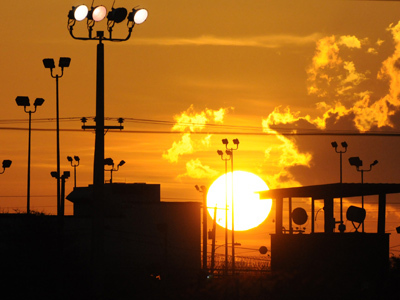 On Wednesday, the warden for the prison told the court that he was not aware of the microphones until just days earlier, but knows that monitoring private legal conversations are against the rules. “We understood that any listening to an attorney-client meeting is prohibited,” testified Army Col. John V. Bogdan, who assumed control of the facility in June 2012 but admits to authorizing repairs to the system six months later without knowing what exactly the upgrades entailed. Those fixes, he says, were ordered by J-2, the on-base intelligence agency that maintains conspicuous surveillance cameras in the cells. "J-2 only said they needed to do upgrade and repair of the video system in December," Bogdan testified. Later in the hearing, however, it was revealed that the December 2012 repairs to the system involved reconnecting microphones that had previously been cut off. 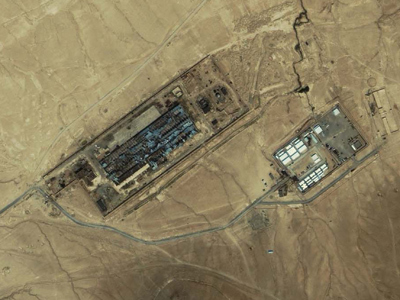 In light of Thursday’s discovery regarding the bin Attash papers, attorneys are likely to demand a more intensive probe into the facility. According to Mr. Cohen, though, that investigation is likely to be a whole other charade. “The real issue will be, ‘what will the military court do now?’” Cohen says. A motion to dismiss with prejudice is a possibility, he suggests, yet personally he believes that the current state of affairs in the White House means that option would be all too unlikely. 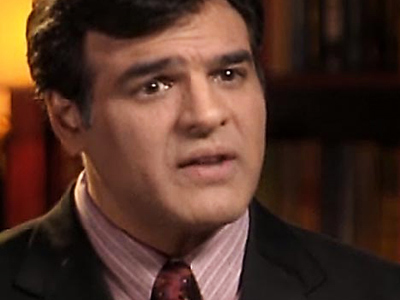 Bin Attash is accused of providing logistical aid to the hijackers responsible for crashing four passenger jets on US soil on September 11, 2001. 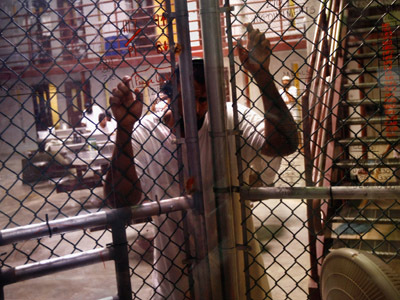 Gitmo detainee Khalid Sheikh Mohammed, the lead defendant in the case, is accused of masterminding the 9/11 terrorist attacks that left nearly 3,000 Americans dead.